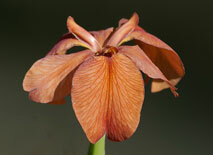 The Louisiana iris species I. fulva is a wonder and a surprise. 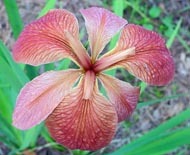 Few expect to encounter wild red irises, but they are out there and not just in Louisiana. 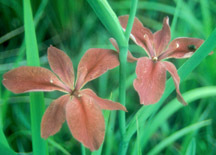 The distribution of Iris fulva may be concentrated in the Bayou State, but it is found in wet areas in the Mississippi Valley as far north as Kentucky, Ohio and Illinois. 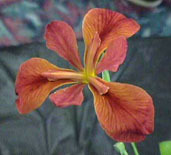 Fulva genes are one of the principal reasons for the hardiness of Louisiana iris hybrids across most of the country. Fulva was the second species of the Louisiana group to be designated. It was named by J. B. Ker-Gawler in 1812, the same year as the Battle of New Orleans, based on a specimen collected in the New Orleans area. Fulva is one of two species that is predominantly red, and it has been the principal contributor of red and related colors in modern hybrids. 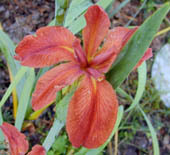 "Red" in the Louisiana iris world is not the fire engine variety, but most often a rusty red color that sometimes is nearer a brownish orange. 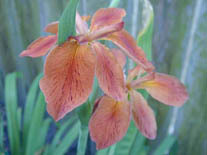 "Copper Iris" is a common name sometimes applied, and that is close to typical fulva color. But sometimes a color approaching true-red is found. 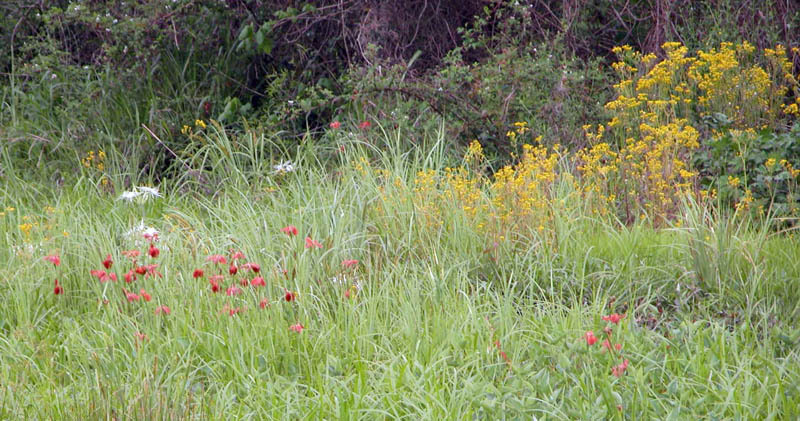 Yellow forms are rare but have been found in both Louisiana and Arkansas. 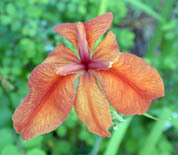 The flower of fulva is relatively small, 3-4 inches across, and frequently all the petals droop. More flaring forms also occur. Fulva does not make the same splash in the garden as the much larger, more substantial flowers of hybrids or even some of the species. 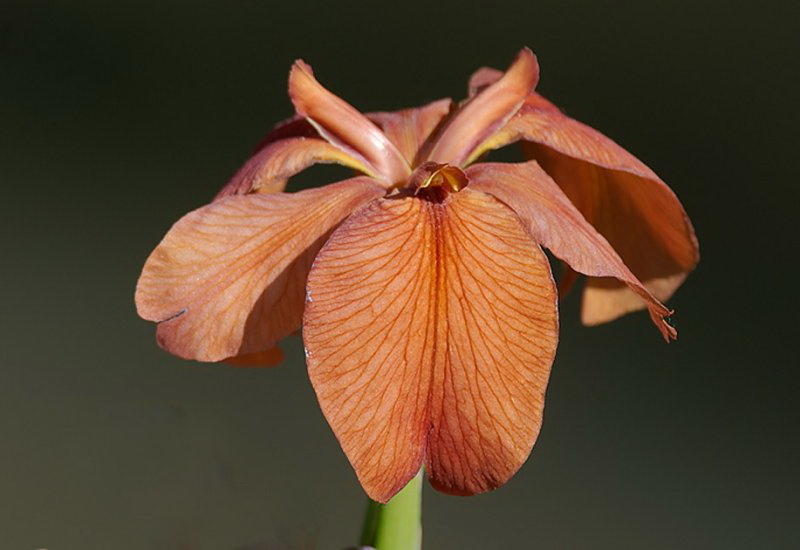 Comparison to fulva shows how far Louisiana irises have come in a relatively short period of time since systematic hybridizing began in the 1940s. That aside, fulvas are unique and charming wildflowers, with no need for apology or comparison to other plants. They are the real deal. 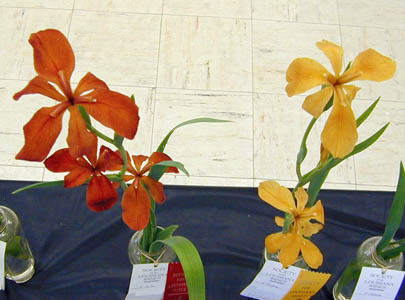 Two excellent fulvas entered by Benny Trahan in the show of the Acadiana Chapter of the Society for Louisiana Irises in Lafayette, Louisiana in 2002. 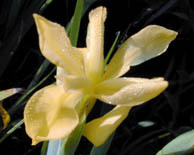 The yellow form is an unusual deep, golden yellow. The few yellow fulvas found generally have been a lighter yellow, as exemplified by the picture at the top of the page. 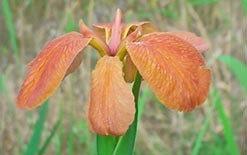 Click here for additional pictures of Iris fulva in the wild. Margaret Stones' Watercolor . Zoom in for detail.